My house is Christmafied! Yes, that is a word! We got our Christmas tree on Saturday, and boy was that an adventure. My husband and I both grew up going to a Christmas Tree Farm, and cutting down our own tree. Since we have been married though, we have never lived near a place where that was economical or easily accessible. Well that all changed this year. We live near the mountains, and the mountains have trees! Saturday morning we were doing our research to see where we should go. My husband came across information about a National Forest that allowed you to cut down trees. You could buy a permit and trek into the forest to get your tree (snow shoes recommended). One little problem, you needed a 4wd vehicle. After calling around we found a place that had a 4wd vehicle available to rent for the afternoon. So we got all of our stuff together and set out on our National Lampoon Adventure. We had to drive about an hour to get there, but once there it was amazing. We were surprised by how many people were there (a couple hundred at least). Smokey the Bear was there to greet everyone and take pictures. We got on our snow shoes and trekked through the National Forest to find a tree! In the end we cut down one small tree for our 6 year old to decorate, and then went to a local place to get a big family tree. As much fun as it was, the trees were all very much Charlie Brown trees. It was a “Forest” afterall. I do think this will become a tradition though, it was something we could have never done living in the Midwest. Oh! Nuts contacted me to see if I would like to try some of their nuts for my Holiday baking. Of course I would!! 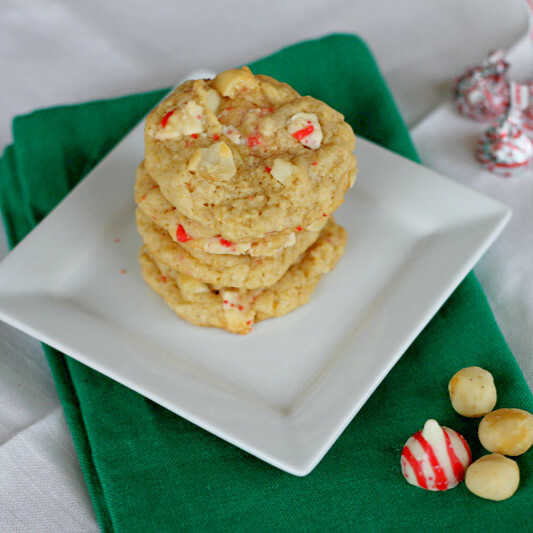 I wanted to do a holiday version of a White Chocolate Macadamian Nut Cookie. 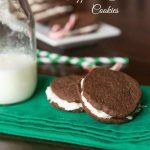 I love the Candy Cane Hershey’s Kisses, and knew they would be a major player in my recipe. 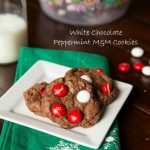 Then, I saw these White Chocolate Peppermint cookies over at Love from the Oven, and knew this was along the lines of what I was looking for. I was very nervous about baking cookies in the altitude, but it worked!! They came out thick and chewy. You can see my alterations in blue below if you are baking at anything over 3500 feet. 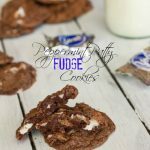 These would make the perfect addition to your holiday cookie tray. 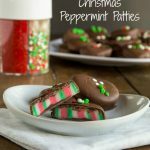 They are soft, chewy, full of peppermint, and have the crunch from the nuts. 2/3 cup Macadamian nuts, chopped. Cream butter and sugars together. Add in eggs and vanilla. Combine flour, baking powder, baking soda, and salt. Add to the butter mixture. Stir in oatmeal and candy kisses by hand. 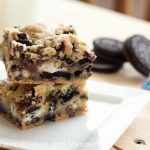 Scoop onto a tray, and bake for about 11 minutes. Cool on a wire rack. Sounds delicious, thank for sharing. These look wonderful. Love the photographs! 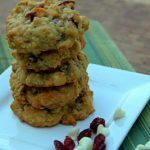 Oooh, I love a good chewy oatmeal cookie, but macadamia nuts always add such a perfect subtle flavor. 🙂 My wife would love the peppermint addition, too! Those cookies look so festive. The whole combination sounds wonderful. What a fun adventure! Cutting down Christmas trees always reminds me of the movie Chevy Chase’s Christmas Vacation. Such a classic, haha. But that is too cool! These cookies sound delicious. I’m a huge peppermint fan, and love the addition of Macadamia nuts. 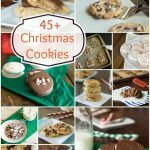 These cookies would definitely put me in the holiday mood. They look delicious. I love the tradition of cutting down a Christmas tree in the National Forest. We live in Montana and this is very popular around here, although, yes they are all very Charlie Brown-esque! These cookies look delicious. 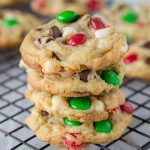 I am not sure I have ever had the nuts and mint combo in the same cookie, but I’d love to try it! Look at these!! 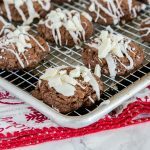 I would never have thought to add macademia nuts to peppermint cookies! But these sound fabulous! I love those peppermint Hershey kisses, but never thought to pair them with macadamia nuts…genius! These look like a wonderful holiday cookie 🙂 I’ve never been to a tree farm, but it’s definitely on the bucket list. 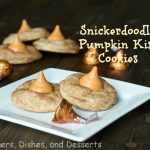 It sounds like a delightful new tradition and the cookies are delicious! I believe your blog is now officially Christmasfied! What a delicious festive looking cookie Erin! What a wonderful flavor combo you created. These are so cute and festive. 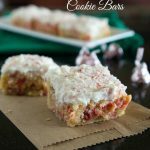 I love the idea of using the kisses! tq for sharing ur adventure story to get the x’mas tree erin, what an adventure! We Christmasfied our apartment a few weeks ago. We always travel for the holiday so I figure we can put up our decorations before Turkey day so we can enjoy them for longer! These cookies look so tasty! 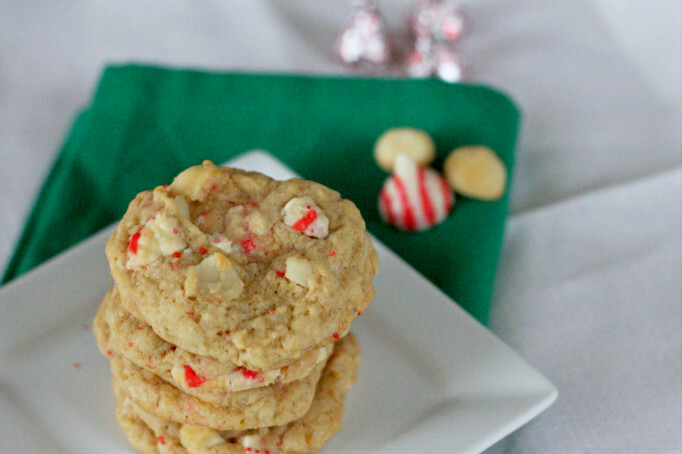 Love the use of the festive peppermint kisses and the macadamia nuts! Wow these cookies look amazing! 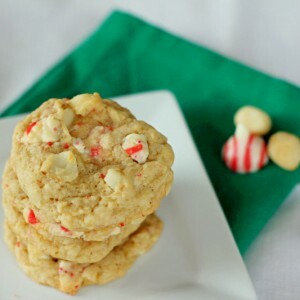 Love the peppermint and macadamia nut combo. Yum! Oh my! These are perfect! Love the mint and macadamia combination. I’m so glad you do a week in review! I missed these fabulous cookies….mmmmmmm. 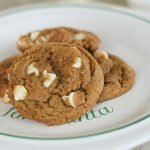 mmm Macadamia Nut Cookies are one of my favorites! my blog is [url=http://cheapfamilyvacations.blogspot.com/]family vacation ideas[/url].